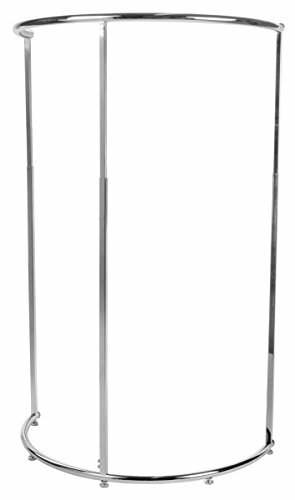 This half circle clothing rack features an adjustable height hang rail, ranging from 48 to 72 Inch. Closed design means that no clothing items will slide off of the hang rail. Made from commercial-grade steel in a chrome finish, to contrast well with any decor. The base of this unit has three levelers, to prevent wobbling in areas with uneven flooring. Total dimensions at maximum height: 45"W x 72"H x 25"D.